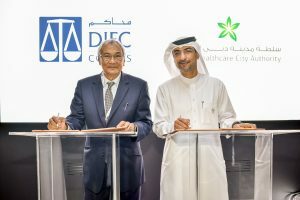 Dubai, United Arab Emirates; 31st January 2019: The DIFC Courts and Dubai Healthcare City Authority (DHCA) have signed an agreement that will see Dubai’s leading healthcare free zone become the first government entity to utilise the services of the DIFC Courts’ newly created Special Complaints Referral Centre (SCRC). Signed at the Arab Health Exhibition and Congress by Zaki Bin Azmi, Chief Justice, DIFC Courts, and Dr. Ramadan Alblooshi, CEO, Dubai Healthcare City Authority – Regulatory, the agreement builds on a strong relationship forged by a Memorandum of Understanding (MoU) between the two entities in 2018 and establishes a framework for DHCA to benefit from the specialised expertise derived from the mediation mechanisms available in the successful Small Claims Tribunal (SCT) model. In 2018 the DIFC Courts’ SCT mediators handled over 390 cases, with an average of four weeks for a case to be resolved. The SCT enables smart, quick and amicable settlement of claims up to half a million dirhams, either virtually from a laptop or smartphone via smart SCT, or directly in a courtroom. As of 2018, the Dubai Healthcare City free zone has more than 170 clinical partners including hospitals, outpatient medical centres and diagnostic laboratories, with licensed professionals from almost 90 countries. In addition, it is home to more than 200 retail and non-clinical facilities, and close to 10,000 individuals work in the free zone. The UAE’s healthcare market is set to surge to more than AED 103 billion by 2021, with research and analysis predicting growth of up to 8.5% from 2018 to 2023. According to a recent report, increased investor interest in emerging sectors such as the cutting-edge medical device market will also play a role in expanding the current AED 64 billion market, as will medical tourism and the roll-out of mandatory health insurance.